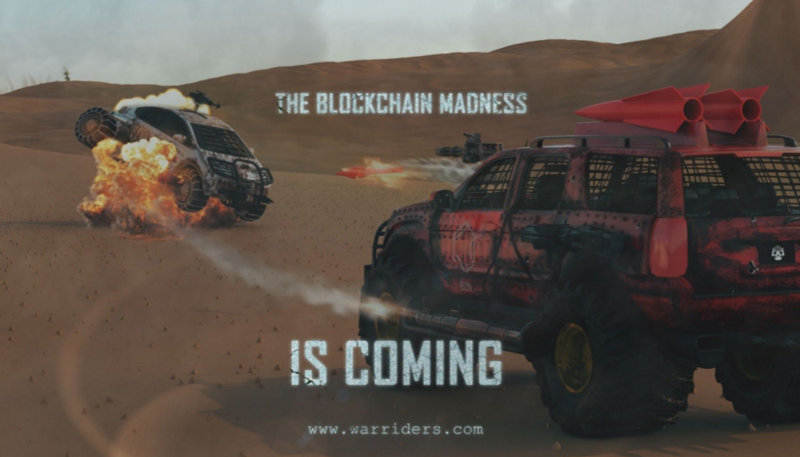 War Riders is currently one of the most anticipated blockchain gaming projects on the horizon. Set in a post-apocalyptic wasteland, players will pilot their vehicles throughout the land in search of the only remaining resource, Benzine (BZN). But finding BZN is just the beginning of your journey, because then you have to somehow remain alive and mobile long enough to make it back to your garage in one piece. Once in the safety of their own garages players can then move the captured BZN to their wallets. BZN is a utility token used on the Ethereum blockchain. Once in your wallet it is similar to any other crypto token, in that it can be traded at an exchange, given away, bartered, sold, etc; it’s yours to do whatever your heart desires. The utility aspect of BZN comes from its use within War Riders (WR), where BZN is the only currency accepted to purchase upgrades for your vehicles and garages. Within the WR ecosystem BZN is valued at $0.5, asset upgrade costs are pegged to a USD$ amount, therefore BZN is, indirectly, a “stable-coin”. For example: let’s say a turret mounted 50 Cal is valued at $20, the only way to buy it is by spending BZN, so 20*0.5 = 40 BZN. In theory the market value of BZN should hover somewhere around $0.5, but I was never one for predicting the market. Once gameplay starts every Rider in the wasteland will be competing to capture some precious BZN, but there are some ways to get your hands on some now, even before the game is officially launched. Check out the list below for five ways I have found so far. Buy a premium vehicle in the pre-sale (Aug 20 — Oct 20). All WR premium vehicles will have their BZN tanks topped-off via airdrop, which will happen at the conclusion of the premium pre-sale. Participate in WR’s bounty - There is a running reward program for participation on the WR Btc Thread. Every ‘quality’ response will net you one BZN. To collect, head back to discord #btc-discussion and post your BCT info there (check the pinned messages for details). Join or start a clan - visit #clan-discussion and read the pinned post there for specifics. In short, any verifiable clan of between 3 and 8 players is eligible for a BZN reward and logo design assistance. Get access to WR closed beta - Planned for the end of this year. Owning at least one premium vehicle will guarantee you a spot in the beta testing. This will be a great opportunity to not only secure some BZN before WR’s official launch, but also learn the ins-and-outs of WR’s gameplay mechanics, little of which has been revealed at this point. Clans are a brand new development for War Riders. Not originally part of the game, but due to popular demand from the WR community, is now being added. Not only that, WR developers are actually offering incentives to clan-up. Besides the initial reward, little is know about exactly what effect clans will have on the game, but there are some possibilities that I have speculated about. For instance not attacking or getting caught in traps laid by your clan members. Also the ability to take refuge in your clansmate’s garage for free or maybe having a shared clan garage. Garages are going to be an important part of WR gameplay. They function as a bank for your vehicles to bring their captured BZN and as a safe-haven for other wanderers in the wasteland. If another players seeks refuge in your garage then you are entitled to a “boarding” fee, that they must pay. Therefore having well placed, or just lucky garages may lead to some amount of passive income. Each premium vehicle kit comes with a garage, which can be located wherever its owner chooses. Give some thought to where you place your garages, once a location is chosen and garage placed, it cannot be moved. If you think you would like to play War Riders but are not familiar with the crypto world yet, now is a great time to look into it. Crypto prices this September are the lowest they have been all year, market cycles being what they are makes this a great time to buy a little Ether. To play WR on PC you will first need to download Meta-Mask, a browser extension. Get that here install it and make sure to record your recovery phrase/seed and private key, keep those somewhere secure. Next you will need to buy some Ether, the cryptocurrency used to play the vast majority of blockchain games, including WR. The simplest way to do that is through Coinbase, after getting through the initial KYC (Know Your Client) verification process, actually buying crypto is fast and easy. Next you will need to transfer the Ether you bought on Coinbase to your Meta-Mask public address, after that you are ready to rock-n-roll. Feel free to leave a comment here or hit me up on discord if you need a little help here, @Aristo80 on the WR server.